The Arabic verb baquia means to everlast. Allah is the EVERLASTING Who has an everlasting Existence; He says, “Butwill abide for ever the Face of thy Lord, Full of Majesty, Bounty and Honour”(RAHMAN, 27), “What is with you must vanish; what is with God will endure” (NAHL, 96).He will never perish and non-existence can never afflict Him; His Existence is eternal and permanent. He is the EVERLASTING Whose Existence is necessary. When His Existence is annexed to the future then to Him is attributed the epithet (EVERLASTING), and when His existence is annexed to the past then to Him is attributed the epithet (Eternal). The EVERLASTING is He Whose existence has no end in the future; the Eternal is He Whose existence has no beginning in the past; all this is included in the word: the Necessary Being; these names are according to what is associated in the mind. The past and the future are the time which includes motion and change. Motion is divided into past, present and future; change causes the changed to have a duration in which this change takes place. What is too exalted to change or be in motiondoes not have a duration and does not have past or future. Allah, Praise and Glory be to Him, had been existing before time, and time can never affect Him, He is the First and the Last, the Ancient and the EVERLASTING. 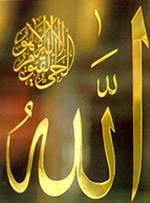 Praise and Glory be to Him, He is Allah.